Exactly one year ago, the tu.tv team spent a white night launching their baby. And as one of the proud parents, I insist on showing you a video of Jon Elosegui and his team installing the first tu.tv server. Thirty servers and over ten Gbits of bandwidth later, we are approaching 10 million unique users a month. 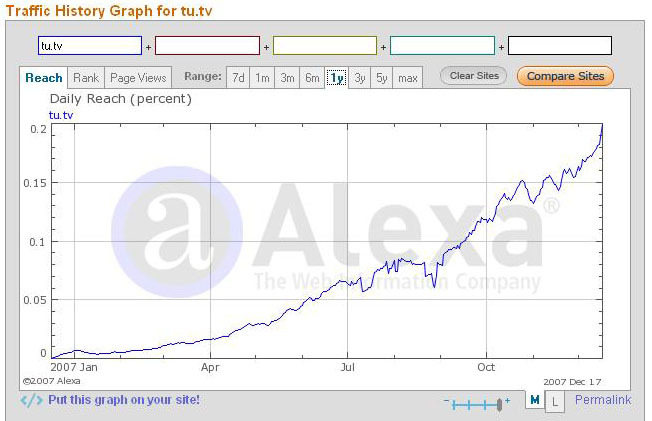 The tu.tv team has hit the perfect viral storm, check out the traffic graph below. The systems department has responded heroically. Even though it occasionally came down to me driving a van full of servers to our London datacenter, capacity has always been ahead of the viral whirlwind’s demand. Nobody says incubating is easy. Not to be outdone, the Sales team has sold its first major brand campaign for Nokia. Unlike straight banners on the site, video overlays have great impact on viewers. Given its similarity with TV advertising, clients and agencies are rapidly accepting the format. All good news on the profit & loss side. It is all looking good for a great second year. Happy birthday and congratulations to Jon, Felix and company. Have a great second year.